"An Odyssey or a Migration"
I have always had a deep interest in wildlife activity. This is intensified in the fall when annual migrations begin for they give me a chance to observe migrating wildlife in great numbers. One experience I will never forget occurred when I first entered university. I had registered in a natural science class and was eagerly looking forward to learning more about wildlife migrations. You can well imagine my astonishment when the professor provided the following explanation for bird migrations; "Birds migrate because their parents migrated, and, their parents migrated because their parents migrated". It was hardly the scientific explanation that I expected or wanted. But, since then, as I have become aware of ice ages, ocean currents, jet streams, seasonal changes, photoperiodism (light), imprinting, magnetite (a cell substance), the earth's magnetic field and many other factors which affect migration, I have also come to appreciate that the professor's explanation was based upon genetic inheritance, experience and as yet, many further undiscovered factors. Yes, I too have come to realize that birds migrate because their parents migrated. Migration is the annual population shift of mammals and birds usually in response to seasonal changes. Light (photoperiodism) rather than climate appears to be the major triggering factor which makes birds begin their seasonal travels. One very dramatic B.C. waterfowl example is the annual flights of the Trumpeter Swans. Small family flocks can be predicted to first appear after the middle of October. Flocks of these, the largest North American waterfowl, appear in great numbers through November and during the winter. B.C. coastal estuaries and marine climate regions like Vancouver Island winter the largest Pacific flyway concentration of Trumpeter Swans, a bird that was once listed as rare and endangered. Bird migration often has interesting seasonal adjustments. 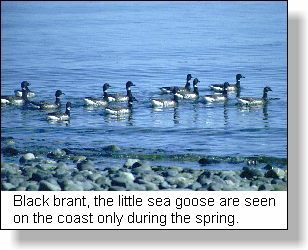 The small sea goose, the Black Brant, migrates north through the Strait of Georgia and is a striking yet commonly seen coastal bird beginning each April. However, in the autumn, Black Brant migrate south along the outer coast, almost along the continental shelf until they reach the Olympic Peninsula in Washington state. None travel south in the Strait of Georgia, the route they used in their spring northerly migration. Why? Because this is the ancient route of their parents. 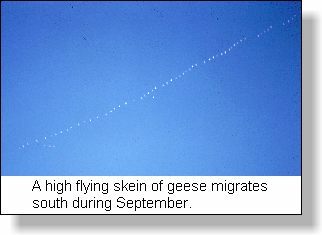 Waterfowl migration for many species occurs when the young are capable of long distance flying. 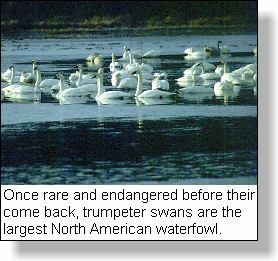 This is the case with Trumpeter swans. 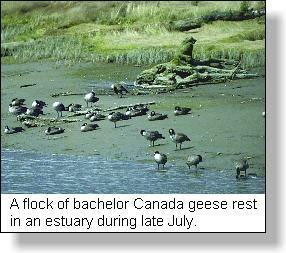 It is also the situation with Canada Geese and other geese species who begin to be heard in September. Often long skeins or 'V' flocks can be watched in the late summer blue skies. Why then, you may ask, are there large flocks of Canada Geese arriving in mid summer. The answer relates to the sexual maturity of these birds. These early birds are in fact 'bachelor' flocks composed of sexually immature geese of from one to three years in age. These are not the family flocks of mature adults and young of the year which have to wait until the young are capable of long distance flying. Geese do not mate until they are four years old and then, they will mate for life with both parents sharing equally in the raising of the annual brood of goslings. Bird migration is not just a seasonal north-south movement. Many ducks like scooters will nest in the interior of the province and merely move to the coast for the winter, performing an east-west migration. In many cases there is also vertical migration from higher mountain ranges to valley bottoms as is performed by the province's official bird, the Steller's Jay. Then there is that oddity, the Blue Grouse, who migrates in reverse by moving down the mountain in the spring to nest and then travels up the mountain in the fall to the sub-alpine areas where it winters feeding on the needles of coniferous trees. Mammals also migrate in many ways. Their movement is also based upon light but it is affected also by changing seasonal weather patterns. Ungulates like caribou and elk may travel long distances from summer pastures high in watershed mountain slopes to timbered valley bottoms. On the other hand sheep and goats travel up mountains in the winter seeking snow blown slopes where they can feed, and, as protection from wolves and other predators. One misnomer that is in common use is to refer to the return of salmon as a migration. In actual fact it is an odyssey, a long wandering journey rather than the seasonal shift from one location to another. The salmon odyssey is a term I prefer for it conjures up an impressive life journey. Some salmon, including steelhead, will take up to five, six or even seven years to travel the open Pacific Ocean before they return to spawn. We know that all five west coast Pacific Salmon species die following spawning adding their vital nutrients to the stream to nourish hatching fry. Steelhead however, will often survive and complete a second and even third journey out to the open ocean then back to their natal stream. A migration or an odyssey? British Columbians have an unique opportunity to watch many wildlife species in their annual movements from one location to another. To be so fortunate to observe the behaviour of wildlife in a province which has our country's greatest variety is a fascinating, intriguing and enchanting experience. When next you hear the call of the goose; or, see the blow from a whale; or, watch struggling salmon in a stream; or, provide winter bird feed for those sassy Steller's jays in your backyard, remember that until scientists can provide a definitive answer to migration, they are there because their parent's were there.